During my childhood, I was exposed to many varied forms of art and culture which have given me an eclectic world view today. From the impressionistic paintings of Degas, to the music of Meatloaf, to the writings of Steinbeck, I sought to experience as many different works of art as I possibly could, encouraged by my parents to seek understanding of myself and others through such means. The Broadway musical was a frequent entertainment and teaching tool for both me and my sister during this time. I have never lost my taste for musical theater and enjoy attending live performances as well as listening to soundtracks and watching filmed versions of shows in the comfort of my home. Throughout the years I have become a devout fan of the composer Stephen Sondheim and his body of work. 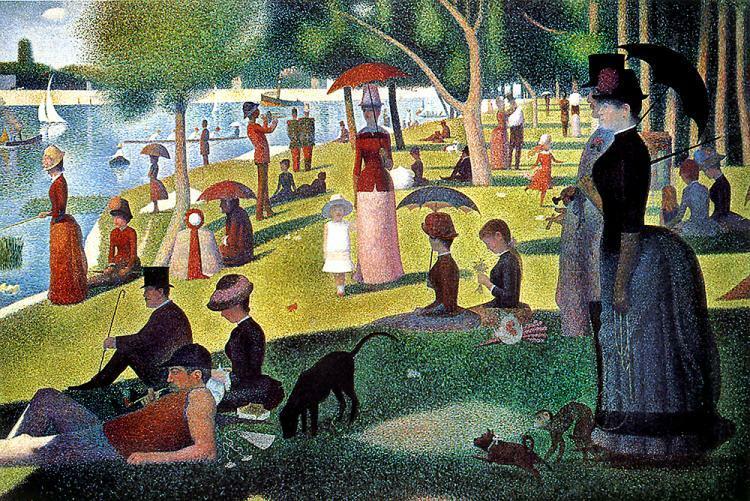 As I’ve pursued my own artistic interests, one musical of his in particular has become very dear to me: his fictional account of the life of the painter George Seurat; a musical called Sunday in the Park with George. 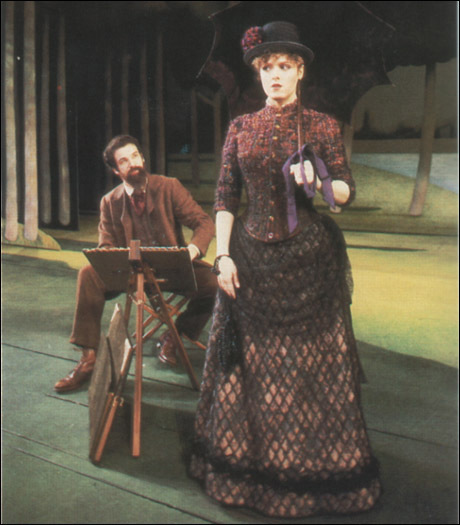 Sunday in the Park with George opened on Broadway in May of 1984. After the disastrous run of his last show, Merrily We Roll Along, Sondheim had publicly and personally vowed to never write another musical again and entirely retire from the business. 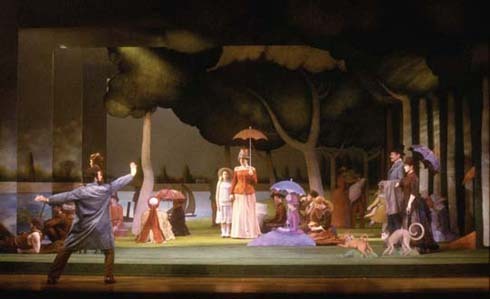 A friend, James Lapine, convinced him to work one ‘last’ time on this piece, seeing as they were both drawn to the particular painting at the center of the story, A Sunday Afternoon on the Island of Le Grande Jatte. It is more than likely that this background of artistic turmoil is what lends this show its particular brand of insight into the creative mind, unlike any I’ve ever seen or experienced. Sondheim is intent on getting to the bottom of what it means to create, what it means to be an artist, and how that affects both the world and the individual. The first time I watched the recording of the original Broadway cast, which stars Bernadette Peters as Seuret’s mistress and model, Dot, and Mandy Patinkin as the title artist, I cried during several of the numbers. It was the first time a work had spoken to my sometimes alienating experiences as a creative adult. I didn’t see the world the way other people did, but rather than finding it liberating or exciting, I often found it confining and frustrating. Why couldn’t I make other people understand why certain things were so important to me? Was I crazy? Unbalanced? Stephen Sondheim showed me I was not – and showed me how to get out of my own way, as it were, and create truly wonderful pieces of art. The first half of the show focuses on the life of George Seurat, his career, his personal life, and the lives of those whom he captured forever in flecks of ‘color and light’. From this segment, there are two songs which I particularly enjoy. The first is “Color and Light”, a duet between Dot and George, where the cracks in their relationship first begin to show. The second is perhaps the most well-known song from the show, “Finishing the Hat”, where George gives voice to the obsessive nature of creation, its rewards, and it’s costs. The second half of the show follows George’s descendent, another artist who lives in the modern era. This new George is struggling to find his artistic voice again, is mired by his own self and society imposed concepts of what is and isn’t art, and finds himself alone, unable to ‘move on’. Two songs from this final half of the play which are dear to me are “Putting It Together” and “Move On”. “Putting It Together” is a frantic, harried detailing of all the hoops a simple artist must jump through in the modern age in order to create and exposes the sometimes demeaning truths of the artistic market. “Move On” is sung by Dot to this new George. The song pushes George out of his artistic rut, tells him not to be afraid to make mistakes, and that creating something new, even if others dislike it, is a triumph in and of itself – an important message for all of us who are striving to be ‘good’ artists. This entry was posted in Inspiration and tagged Arts, Bernadette Peters, Creative, Essay, George, George Seurat, Inspiration, James Lapine, Literary, Mandy Patinkin, Merrily We Roll Along, Non-Fiction, Robin Jeffrey, Stephen Sondheim, Sunday in the Park with George, Writing. Bookmark the permalink. So many important lessons…not just for the artist, but for anyone seeking to make their way through life in a meaningful way.